Some of the world’s greatest companies have started as family businesses. Many remain family businesses after many years and, frequently, family members own large positions in the company’s stock. Well known examples include Walmart and Ford Motor Company. 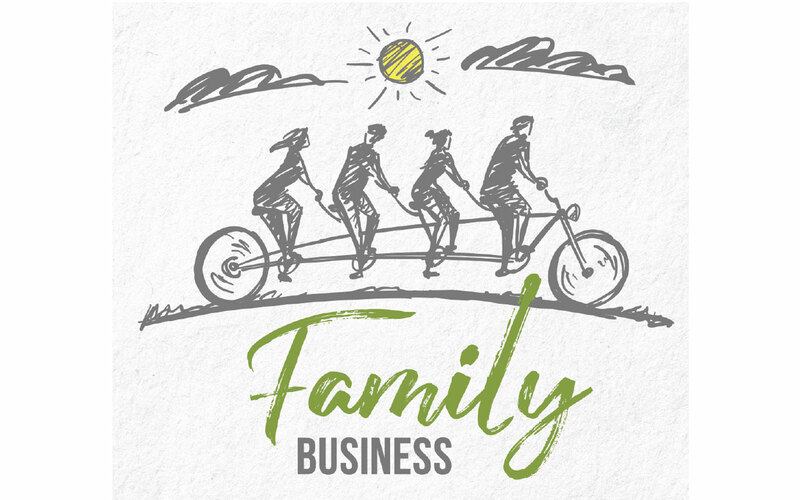 About one in five firms (19.3 percent) are family-owned, according to the Small Business and Entrepreneurship Council. As of 2013, family businesses made up 35 percent of the Fortune 500. Some examples of famous father/son CEO successions include Ralph Roberts and Brian Roberts, both CEOs of Comcast. Also, Daniel Amos and his dad, Paul Amos, of Aflac. Then, there is Howard Levine and his dad, Leon Levine, CEOs of Family Dollar stores. In the trades, skilled tradespeople who have been self-employed have handed the baton off to their offspring to carry on a family business, whether it be plumbing, electrical work, roofing or drywall. The parents have understood that the work they have done has provided a healthy living and they feel confident that their trade will do the same for their kids. In the medical equipment industry and the HTM profession, the thinking goes much the same. Family members who have started out as biomeds, or who have started medical equipment companies, know that both will always be in demand. There is a level of confidence that this is a good path for the next generation of their family. With a graying baby boomer generation requiring more health care, health care related professions are in demand. Those same baby boomers are retiring from the HTM profession, leaving a glut of unfilled positions and growing demand for more biomeds and imaging service engineers. 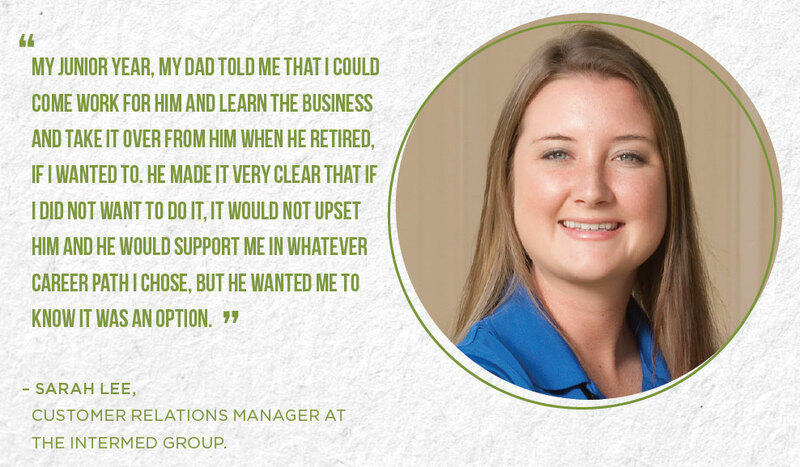 It’s natural for a parent or other family member to suggest this beneficial career path to a member of the next generation in the family. According to data from the U.S. Census, by the age of 30, 22 percent of working American men will work for the same employer, at the same time, as their fathers. The tendency to follow a parent into the same profession isn’t a complete surprise since much of it can be traced to household culture. Parents frequently instill interests into their children that they have. The parent who is working in a shop in the garage may impart that hobby or interest to a son or daughter. A child, who sees a parent working with their hands and creating something, will often seek to duplicate that skill. Glenn Scales retired from HTM in North Carolina and is a past-president of the North Carolina Biomedical Association and the group’s first vice president. He got his start as a BMET in 1967. His son was working in another field until Scales suggested he investigate HTM. “David worked following high school at a nearby multiplex cinema in a variety of jobs including systems maintenance and digital projectionist for the 16 screens and their IMAX. It was keeping him quite busy. He was offered a supervisor’s position, but chose not to pursue this as he was hoping to find employment soon and didn’t want the theater to invest in his training, etcetera., only to leave,” Scales says. He says that his wife and he persuaded their son to enroll at a local campus of East Coast Polytechnic Institute University. “He graduated last fall with a degree in electronic engineering technology. While a student, he helped start a local chapter of IEEE and was inducted into the Phi Theta Kappa Honor Society. Half-way through his degree, he decided that he was interested in working in HTM and was able to complete an internship at Durham Regional Hospital, one of the campuses of the Duke Healthcare System,” Scales says. “So far, he has had interviews at local hospitals, but has not yet been hired. Most of the positions have been filled by candidates with several years of experience and he is getting a bit frustrated but is still looking to get into HTM. Many of the local hospitals want to interview people with multiple years of experience and it’s difficult to get into entry level positions straight out of a two-year engineering program,” Scales adds. Dave Francoeur, senior director of brand and quality at Sodexo Clinical Technology Management, has been an influence on several family members’ decision to join the HTM ranks. Francoeur, who has a long history in HTM management, and was once the chair of AAMI’s Technology Management Council, introduced his brother, stepdaughter, godchild/second-cousin and nephew to the field. “My godchild/second cousin obtained his bachelor’s degree in computers. I hired him to be the department CMMS manager/overseer. Once he got into the day-to-day operations of the HTM community, I sent him to training for maintaining fetal monitoring and telemetry systems. Today, he is fully integrated into the HTM department,” Francoeur says. His nephew had served in the military as a helicopter maintenance mechanic individual for five years. Francoeur worked with him to acquire a few skill sets and apply for a role within HTM. He is now a successful HTM professional. Bill Hart, a clinical engineering supervisor at Lakeland Regional Health in Lakeland, Florida, passed the baton to the next generation also. Hart’s son decided to enter the HTM profession after having the opportunity to rub elbows with those in the field. “He was in high school and had mentioned a few professions that included health care like EMT, etcetera. I had brought him into the hospital on many occasions for school projects and student day. Then, when EMT was not his thing, he asked about HTM,” Hart says. Hart says that he has always been active in the local and state HTM societies and yearly symposium. “I would encourage him to attend with me and see if this was something he would be interested in. It didn’t take long that he started to know on a first name basis individuals and manufacturers in the HTM field. Soon afterward, he enrolled in a local technical school call Aparicio-Levy. I would speak to the students from time to time and elaborate on the HTM field. After graduating, he landed a job just north of Orlando and the rest is history,” Hart says. With two generations in the HTM profession, the conversation changes as the learning curve advances, as Hart has learned. “For him it was a lot of questions in the beginning, such as how would I perform this or who would be a good contact for this,” he says. “Now, I have someone to talk to about the HTM field. We bounce ideas back and forth. I would ask about his daily activities and see if I could use some of the ideas, such as what CMMS or test equipment. Altogether, it feels that as a dad, I have extended my knowledge through him to continue and contribute to a profession that we both have a passion for. As I have told him; ‘We work on equipment that works on you,’ ” Hart adds. The medical equipment industry reflects the larger business community with family-businesses well-represented. It has been common for a parent to strike out on their own and start a small business, with an offspring joining in later. Many of the medical equipment businesses, that are familiar to biomeds, are either family-run or include the next generation. 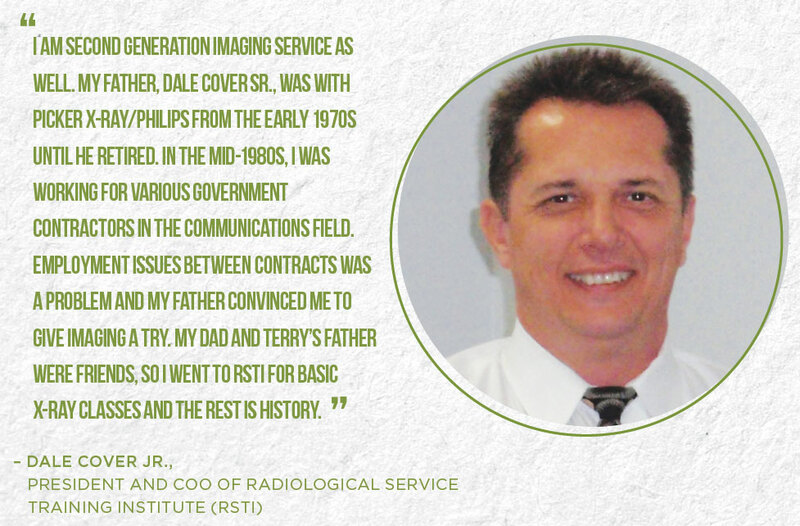 At Radiological Service Training Institute (RSTI), in Solon, Ohio, the founder’s son, Terry Speth, remains as the second-generation in the business. Speth’s late father started the business in 1985 and his wife is the company’s CFO and CEO. The company’s president and COO, Dale Cover Jr., also followed his dad’s lead in the imaging business. “Terry Jr. worked at RSTI on summer breaks during college and began working here full time thereafter. Terry actually purchased his shares of the company from existing shareholders several years ago,” Cover says. “I am second generation imaging service as well. My father, Dale Cover Sr., was with Picker X-Ray/Philips from the early 1970s until he retired. In the mid-1980s, I was working for various government contractors in the communications field. Employment issues between contracts was a problem and my father convinced me to give imaging a try. My dad and Terry’s father were friends, so I went to RSTI for basic X-ray classes and the rest is history,” Cover says. Bruce Hull, general manager for Network Imaging Systems (NIS) in Charlotte, North Carolina, started his business in 2002. He was the lone employee for the next couple of years. “As business picked up, I was spending most of my time taking service calls, looking for new customers and managing accounts,” Hull says. His son, Brent, was not yet a part of the company. “Brent had graduated from Georgia Tech in 2002 with a master’s in mechanical engineering, and he was working for an engineering firm in D.C.,” Hull says. “In 2004, during the week between Christmas and New Year’s Eve, Brent was at home for the holidays and we were discussing what I did on service calls. He went with me on a call during that week, and he liked the CT technology. Six months later, he was the first dedicated NIS Field Service Engineer. Within the next 12 months, we had added new service accounts and opened our first warehouse for inventory storage, parts testing and system testing,” Hull adds. He says that NIS was restructured from a LLC to a S Corporation and Brent and he became partners in 2008. “Today, we both enjoy the variety in our work. We have dedicated employees – field engineers, salesman and an office manager – and a shop with four CT bays, a paint booth and MRI trailer that we use for training and testing. We buy, refurbish, sell, install and maintain CT/MRI systems. We are thankful every day for the opportunity to do it again tomorrow,” Hull says. In 1997, Robert Probst founded Technical Prospects. “He wanted to fill an industry gap by offering Siemens-specialized equipment engineering and turn-key equipment sales,” says his son Jeremy Probst, who is now the president and CEO of the company. “He then moved into the parts business shortly after noticing an opportunity to supply the industry with quality replacement parts. Having previously worked on Siemens CT equipment for more than 18 years,” he adds. When his dad made the move to venture into additional modalities beyond Siemens CT, he was going to need help. “I had recently graduated from the University of Wisconsin-Platteville with a degree in industrial technology management and, with that, offered a new perspective and understanding of the industry and technology,” Probst says. What began as a one-man operation in a 10-foot by 10-foot bedroom has grown into a 72,000-square foot facility. “To keep that momentum, we invested in enterprise resource planning (ERP) software to help streamline processes and better manage all aspects of the company, further helping us set Technical Prospects up for infinite growth in the years to come,” Probst adds. “I believe that having our roots as a family business has created an extra emphasis on providing the best quality parts, services and training possible. Our team works to provide health care facilities with the same level of quality support that we would want to receive if our own family members were receiving care there,” he says. What is it like taking the reins of a business that a parent began? “There is a strong trust and mutual respect between the two of us. 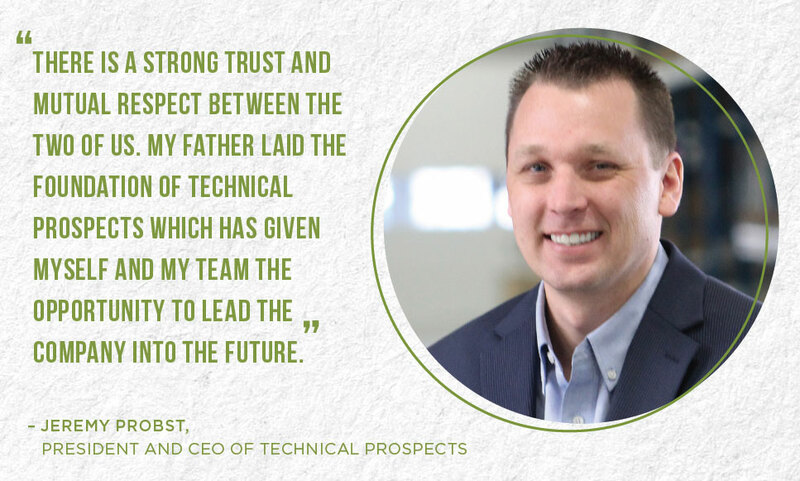 My father laid the foundation of Technical Prospects which has given myself and my team the opportunity to lead the company into the future,” Probst says. “In the same way I push my team to provide the best services and parts possible, he always pushes me to ask myself, ‘How can we continue to improve?’ He is just as excited for the future of the company as any of us, and to see how our business continues to grow and evolve to meet customers’ distinct needs,” he adds. Carolina Medical Parts has also been a family-run business in the medical parts space since its inception. The company was founded by Rick Sagadin and his wife, Kay, in 2004. “Rick started his career in the medical field with GE in the mid-80s in their CSI research and development department in California,” says Kay Sagadin. “From there, he moved on to Diasonics (Toshiba) as a field service engineer. After a move to Pennsylvania and then North Carolina, he decided to start his own MRI service company, Technology Management Group (TMG) along with two partners,” she says. Kay also worked at TMG as a sales consultant and administrator. TMG became successful as a service company and also as a repair facility for other independent service organizations parts as well as repairs for the OEMs. TMG was purchased in 1998 by Picker International. Rick remained with Picker-Marconi-Philips for five years. Sagadin says that in 2004, she and Rick left Philips to start Carolina Medical Parts as a stand-alone repair facility. In 2005, their daughter, Katrina, and their son-in-law, Chuck, joined the company as a sales consultant and refurbishment specialist, respectively. “Again, in 2014, the family part of the business expanded when grandson, Kyle, joined the company as a part-time employee after school and during the summer. Now younger brother, Jason, is on board doing the essential low-tech jobs that no one else wants to do,” Sagadin says. Carolina Medical Parts has grown from a new entity in 2004 to a company with worldwide recognition today. Sometimes families grow a business and then sell it. That was the case with Rick Player, the owner of Medical Imaging Technologies Inc. and his daughter, Sarah Lee, who was the company’s chief operating officer. “My dad started his business in 1987. He had worked for Phillips for a little while and decided to start his own CT service business. Growing up, I always went to the office with him and traveled all over when he went on service calls. I was attending Florida State University, planning on either going to medical school or pharmacy school,” says Lee, who is now the customer relations manager at The InterMed Group. She says that in April of 2018, he sold the business to The Intermed Group. What would Lee suggest to an HTM professional considering making the leap to self-employment? “I would tell them it is harder than you think to just start a business in health care, so to make sure they do their research about everything you need, like liability insurance, state certifications, etcetera,” she said. 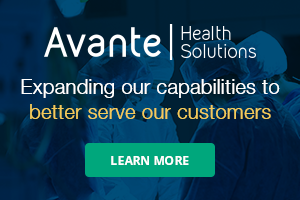 Whether supplying medical device parts, service or training, in addition to maintaining those devices as part of an in-house operation, the importance of supporting patients and health care has been worth keeping in the family. With the need for health care increasing and the growing complexity of technology, the goal of passing these important roles to the next generation cannot be underestimated.